How good is the Civil Service at running its business? Government spends around £600 billion each year on running its business operations, and most government organisations have committed significant time and money to improve their management of these services. Rob Barnes, a civil servant on secondment to the National Audit Office, assesses how well the Civil Service is doing – with advice on how we could do better. Alternatively, it is the glue that binds all the constituent strategies, processes, data, learning and development, recruitment, leadership priorities, projects, policy changes, legal frameworks and everything else organisations have to juggle into a coherent whole. Having worked in the corporate centre of departments for a while now, I became interested in management systems as a way of understanding how the Civil Service controls how it runs itself. It is why I am at the National Audit Office (NAO) for a year! Why are these four areas so important? When we work with organisations, we consistently find that if these four characteristics are present and strong, organisations can be more confident of delivering and improving the outcomes required. If they are not present, organisations can suffer from: poor service and a lack of continuity for the customer; preventable customer demand from not getting it right first time, putting further burden on processes; inconsistent decision-making; low staff morale; and improvement programmes that aren’t sustained. What are the requirements of government, the citizen and Parliament? How do we truly understand and respond to them? Can we deliver those things more efficiently by getting this right? Understanding what internal and external customers want, and consistently trading off competing demands, is critical to ensuring organisations deliver the right thing effectively and efficiently. It also means they have better knowledge and agility to respond to variations in demand, such as planned and unplanned surges. What is the customer journey across all, or one or more, public sector organisations? What is your part in that? Do we contribute to or detract from what is required? A recent Institute for Government report reinforced both how complex the landscape of public delivery is for the user and the urgent need to look at it from the outside to ensure we’re getting it right for them. So, it is critical that decisions are made for the benefit of the whole rather than parts of the end-to-end customer journey. One of the key indicators that this works well is the presence of a process owner, across the end-to-end system, who has decision-making authority. Successive CSQ articles have highlighted how good data can really help deliver sustainable improvement, such as using data to help offenders find work. This worked as it tied together the end-to-end customer journey between the Ministry of Justice (MOJ) and the Department for Work and Pensions (DWP). Corporate memory – supporting knowledge-sharing and lessons learnt – is vital and is something Sir Nicholas Macpherson spoke about in a recent BBC interview on corporate amnesia. It is especially important in areas where process volumes are small and timescales are long, such as policy-making. 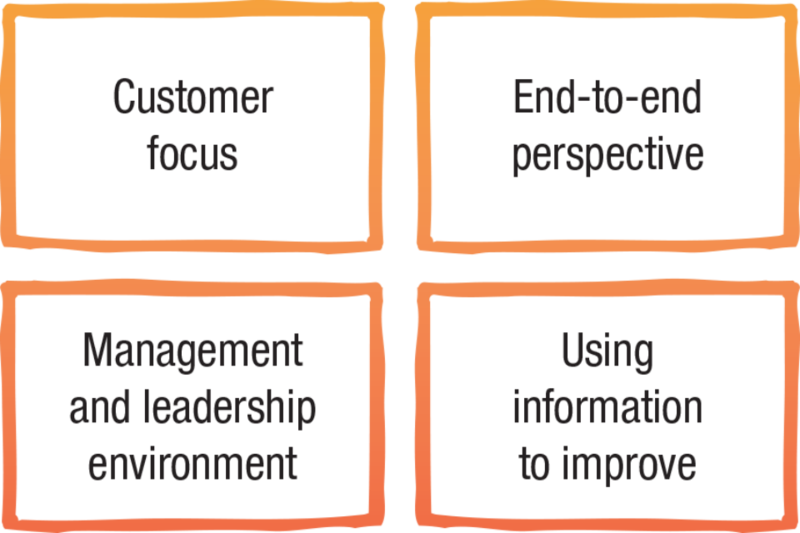 How do organisations continue to learn and improve? It is the organisational learning that is key. Processes and organisations need to learn from people’s experience as well as the people themselves. Getting these different things right throughout an organisation ensures it can become better at managing and improving its business. We have found that these four areas are closely interrelated. One will not be effective without the others. But what is the glue that can bring it all together? 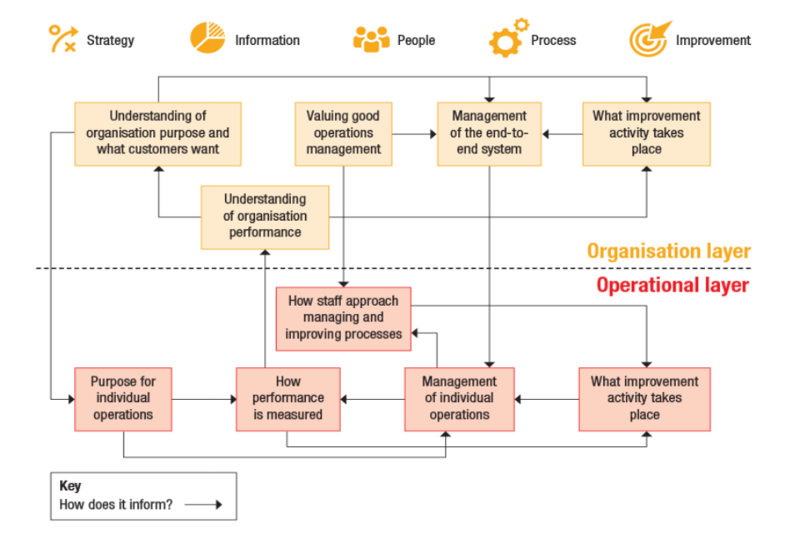 The diagram below is an example of the relationships between the different parts of a ‘management system’. These are critical. Many organisations have the constituent parts (and good ones at that). For example, our work shows that the UK Government is strong at developing strategy. But what brings that and the end outcome together explains how well the organisation and its people function. This is the ‘glue’, or rather the holistic system, that is needed to make change stick. The individual parts of the management system don’t exist in isolation. They need to seamlessly interact with one another. Overall effectiveness is dependent on the capability and interaction between its component parts. For example, how does the organisational strategy influence the day-to-day work of people delivering services to customers? There are many successful examples out there that bring the four critical factors together in a systematic way to improve outcomes. HM Courts & Tribunals Service has improved processes by looking at things end-to-end from the customer's perspective. This has led to dramatic changes in many of their sites. For example, improvements to the way witnesses give evidence resulted from the police, Crown Prosecution Service (CPS), witness service, prisons and probation working together to identify solutions. Helping the agencies involved to see the problem from an end-to-end perspective, they have been able to fix it together, using new technology to improve the service for customers. And by enabling some agency partners, such as the police, to give evidence remotely, they are saving valuable resources. In the courts that are most advanced, judges are getting involved too. Stakeholders attend meetings, and they really contribute to planned work conversations, helping to overcome problems faced on a daily basis. This includes ensuring the start times of courts work well for all the agencies and customers attending court, to allow everyone to be in the right place at the right time. The Policy & Evidence Transformation Team at the Department for Environment, Food & Rural Affairs (Defra) have been using an innovative ‘systems approach’ to help review its ways of working and redesign the policy and evidence function end to end across the organisation. The approach was developed, at zero cost, in partnership with the Environment Agency’s in-house ‘continuous improvement’ specialists. Staff involved day to day, across the spectrum of Defra and delivery bodies’ policy activities, came together to map the policy system – from strategy and departmental priorities, through end-to-end policy-making to delivery and final customers. No stone was left unturned, and the team got under the skin of how policy is made in the department. Understanding policy as an end-to-end system has enabled teams to identify and prioritise improvement work. This programme has enabled Defra policy leads and their teams to find new ways of working, achieve efficiency, deliver value for money and provide the opportunity for staff to shape the future. This kind of work is also taking place in public services overseas. For example, Results Washington is bringing greater alignment between how Washington State, USA, measures performance and what matters to citizens. Previously, it mostly focused on individual agencies and missed opportunities for collaborating with other agencies. Goals are now defined based on what citizens say they value, not what agencies the state happens to have or what those agencies think they should be doing. To facilitate collaboration, teams of agency directors are assigned to ‘goal councils’, each focusing on a particular area, such as education, with specific, measurable objectives. Measures are defined in conjunction with citizens, representative stakeholder groups and experts. One agency is accountable for each objective, but all have clear responsibilities for contributing. Sessions are streamed live and posted online, along with the goals, improvement strategies and current metrics. It is bringing benefits in all goal areas: for example, saving millions of dollars on the cost of providing care in a nursing facility by increasing the number of services in home and community-based settings. No one organisation has ‘cracked it’ and completed a full turnaround. Instead, there are parts of organisations that have done incredibly well in specific areas. This is what makes collaboration and sharing across government so important. I want to use my secondment to bring people together and share examples of good practice across government that have the potential to improve us as a whole. If you want to find out more about this work, read the NAO report – and let us know what you think. Why not test yourself against the questions in it? How mature is your management system? How do you know? Finally, if you’d like to collaborate, please get in touch at: rob.barnes@nao.gsi.gov.uk. My role is in high level complaints: the end to end process of a case is very much at the forefront of how we approach case reviews, to address client issues. We provide a lot of feedback down the line to demonstrate the areas of the main customer issues, and process areas where customers 'come a cropper' in their dealings with CMG/CMS. It's had an impact on how CMG/CMS approach customers, and the increase in customer satisfaction is testament to our quality/Voice of the Customer attitude. However, I think we should be wary, throughout DWP, of setting up standard systems in dealing with our customers: the one thing we have learnt in the last 10 years in Complaints Review is that you have to treat each customer individually! [Also: my son is a Data Scientist in DWP (sorry: proud mam!) - a new area of research in the how and why beyond simple MI facts and figures to understand and tailor and focus on the best way to help customers - exactly what you're highlighting in 'Using Information to Improve' (Longbenton, Charlie Boundy Senior Manager...)].